Meet your next challenge. Knock out 15 or 30 reps on some bodyweight classics, and get ready to sweat. This is a test of your strength and fitness, and a great full-body workout to keep around. Got 10-15 minutes? Then I've got just the way you should spend it. The 240 challenge is a high-rep routine meant to build strength while giving you a cardiovascular workout. It trains every muscle in your body and allows you to check and test your overall fitness level. The best part is that you can take as long as you need to finish the challenge, and you'll have a number to try to beat moving forward. The workout alternates upper- and lower-body movements, spreading the fatigue and getting your heart and lungs seriously pumping. But as you become tired, it's crucial that you resist the urge to get sloppy. This isn't "30 reps at all costs." It's 30 clean, strict reps. If you need to stop and rest in the middle of a movement, by all means do it. Then, when you're ready, jump back in and finish your reps.
You can do this workout every other day, either before or after your other work, or as its own workout whenever you want to test yourself or get some solid full-body work in. Engineered Pre-Workout Delivery System! Ballistic Muscle Energy! Go Now! Use an overhand grip, slightly wider than shoulder width. Hang to full extension at the bottom, and go up until your chin is over the bar. Don't do any kipping, and keep your form strict. Remember, this is a test of your fitness. If it takes you one set, great. If it takes you 15 sets, great. If you can't do 15, then use a band or something similar, but use the least amount of assistance you can. Go as low as you comfortably can here, but more importantly, keep your back straight, and get as high in the air as possible. You can also try to take your knees up as close as possible to your chest, but if you're not there the first time around, that's fine. "Elevated" here doesn't mean your torso is at an angle above your feet, although you certainly can perform these reps that way if necessary. What it means is that your hands are on two separate elevated surfaces, such as steps or weight plates. This allows you to go down deeper and get a stretch across your chest and shoulders. It also means each of the 30 reps is harder. Don't cheat the range of motion, though. Go all the way down and up on each rep. If that means you need multiple sets to get all the reps, so be it! Keep these under control. 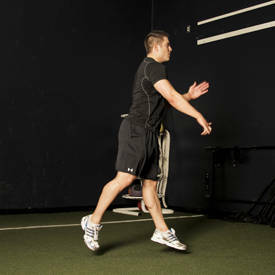 You want that back knee to either lightly tap the floor or hover just above it. Nothing fancy necessary here. Just put your hands a foot or so away from the wall, kick up, and hold the handstand with your shoulders strong and deep in the sockets. 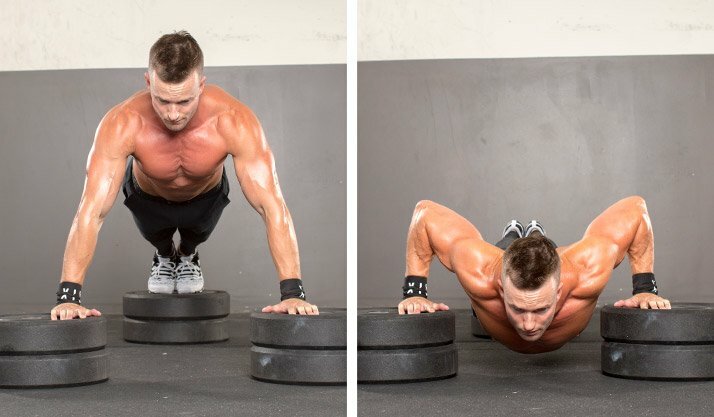 If you want, you can certainly rep out handstand push-ups during the 30 seconds, but after all those jump lunges, a static hold might be all you can handle. If you're too tired to go all 30 seconds, just come down, and when you're ready, kick back up and finish the 30 seconds. Two keys with these: Jump as explosively as possible, and land as silently as possible. 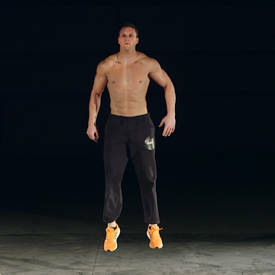 You can either jump or step back off the box, but if you jump down, reset between reps. Don't turn these into depth jumps, where you land and use the stretch reflex to rebound immediately into the next rep.
Keep your palms facing you at slightly inside shoulder width on these, which will work slightly more biceps than back. But don't worry, there's still plenty of back. Start each rep from a dead hang, and go up until your chin goes over the bar. If you can go higher, so that your collarbone or chest hits the bar, do it. 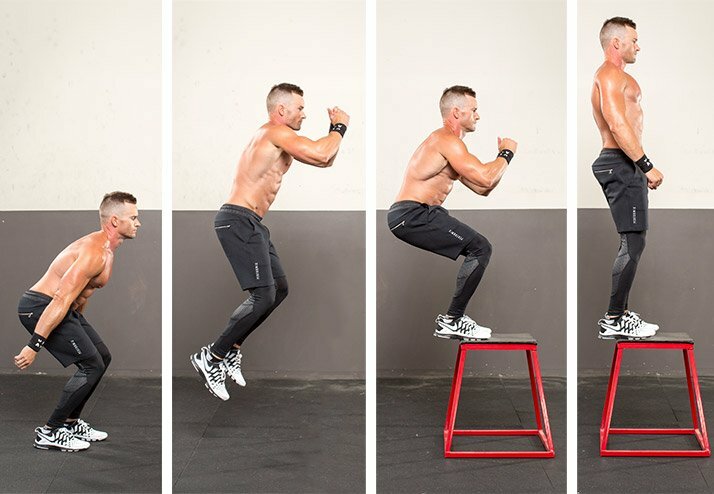 I like to keep my feet elevated on a box for these, so that my body forms a V-shape at the bottom of each rep; it really focuses all of your weight on the triceps. Go as deep as you safely can, and keep your elbows in tight to your body. Your abs have actually gotten a lot of work over the course of everything you've done so far, but you're going to focus squarely on them in this final workout. I like to perform these so my knees go all the way up to my armpits, alternating sides. Stay in a dead hang, and keep your torso as high as possible. Don't swing or use momentum. Sure, that will make each rep harder, but that's the point. No matter how tired you are, don't cheat. Use the full range of motion. If you have to stop and start again, do it.